Thanksgiving marks the beginning of the holiday season. For many, it can mean overindulgence in heavy plates loaded with turkey, rich stuffing and mashed potatoes. However, for food insecure households in our community, celebrating the holiday festivities is a bit more difficult. Access to affordable healthy food is a challenge for many DC Metro Region residents. In the District of Columbia, more than 13% of the population faces food insecurity. Along with hunger, lack of access to healthy food contributes to poor health outcomes. Food insecurity frequently leads to a diet which is void of basic vitamins and minerals but overwhelmingly high in saturated and hydrogenated fats, simple carbohydrates and sodium. Elevated rates of depression, obesity, diabetes, heart disease, high blood pressure, increased risk of infection and malnutrition are all associated with food insecurity. For those living with a chronic illness, proper nutrition can minimize the side effects of harsh medications and treatment, risk of infection and hospitalizations. Consistent access to good food plays a powerful role in preventing, treating and surviving serious health conditions. People who are HIV positive are more likely to routinely face food insecurity. Food insecurity within the HIV positive community at the national level impacts an estimated 48-50% of the population. Food & Friends’ consistent provision of well-balanced and nutritionally complete meals is beneficial to clients by improving adherence to antiretroviral therapies and supporting CD4 cell levels, helping to keep HIV clients’ viral loads in better control. Rates of food insecurity are also much higher for people living with cancer (approximately 56% of the population). Delivering food to these individuals and their families helps them maintain their weight throughout treatment which reduces rates of malnutrition, decreasing overall mortality and disruption to treatment due to infection or hospitalizations. Chronic illness has profound impacts on the demand for food nutrition services, especially the need for medically-appropriate nutrition. Food & Friends’ clients have unique nutritional needs and challenges that need to be met. 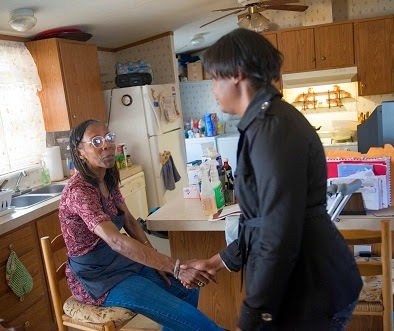 With the support of our partners, volunteers, and donors, Food & Friends will continue to connect the community with our most vulnerable neighbors to ensure that they receive the nutrition needed to battle their illness.